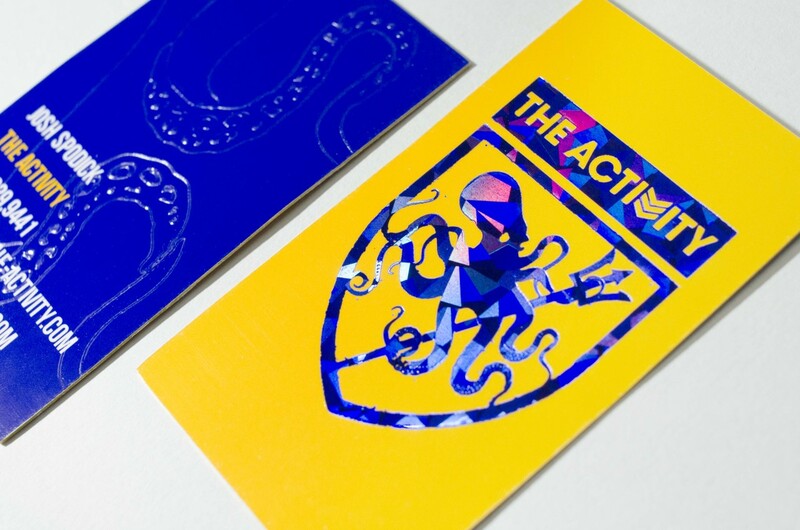 Spotlight On: Metallic Printing for Business Stationery | Publicide Inc. They say there’s a rainbow at the end of every rain: illuminate your correspondence and add a little sparkle to your office with Custom Metallic Printing. Branded Business Stationery keeps an ordered frame of mind: with the stimulative power of a letterhead logo registered in shimmery silver Offset ink, business owners can rest assured that joy is an added benefit. Beyond pigments with lustrous finishes, manic metallics are achievable with Foil Stamping. Gold, Silver, and Rosegold are standard pressings; Glossy Black and Incandescent Mauve are the favored elemental gemtone color laminates of the season at our NYC Print Shop. (Expect Cobalt Foiling to explode next.) Finally, consider adding Metallic Edge Paint to your notepad or stickypad cube, and you’ll find it’s never been so easy to color within the lines. Custom Notepad Printing and Flat Retail Envelopes take off with Offset Ink + Gemtone Foil Stamping. Land your pen, crayon, or quill on Super White + Soft White Mohawk Premium Text Papers. Somewhere over the rainbow, Holographic Foils fly. Soaring Stationery is our Specialty! Email Publicide for your next run of interstellar Custom Business Printing.